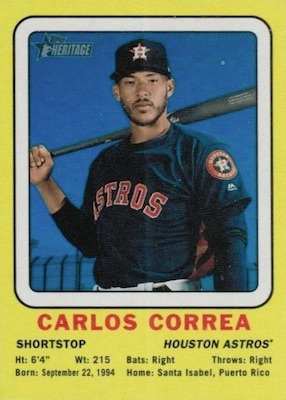 Round two of the '69 retrospective, 2018 Topps Heritage High Number Baseball shifts the primary focus to rookies and traded players. The continuation of the main Heritage line again offers one autograph or one relic per Hobby box. Starting right from the end of the 2018 Heritage base set, High Number has 225 base cards of its own, which runs from #501 to #725 in the checklist. The final 25 cards are short prints that combine to average 1:3 packs. Standard parallels return with Black Bordered (50 copies - Hobby), 100th Anniversary Backs (25 copies), Magenta Backs (10 copies), and Flip Stock (5 copies - Hobby). There are also Mini cards, numbered to 100, and Chrome versions. The main chromium edition is numbered, as are the Refractor (#/569), Black (#/69), Gold (#/5) and SuperFractor (1/1) parallels. Chrome Hot Box Refractor parallels are exclusive to Hobby and Value hot boxes. Still not enough? The 2018 Topps Heritage High Number Baseball checklist is again overflowing with SP variations. The short-print docket includes Hobby-only Action Image and Team Name Color variations, plus Errors, Nicknames, Traded, and Throwback Uniform cards. Inserts are also plentiful in 2018 Topps Heritage High Number Baseball. There's Award Winners for the 2017 standouts, Combo Cards with a related headline for two players, Now & Then, which looks between 2017 and 1969, and a fresh allotment of first-year players in Rookie Performers. In addition, more of the unique die-cut cards come with 1969 Topps Deckle Edge. 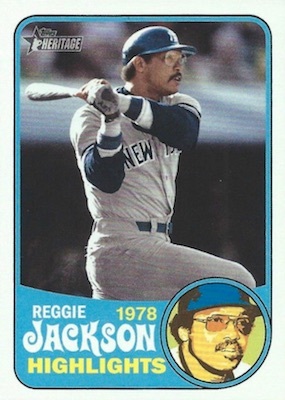 New this time around, the Reggie Jackson Highlights insert covers the legend in a Hobby-only insert. Meanwhile, Miracle of '69 is dedicated to the New York Mets. Delivering one hit per Hobby box, collectors can count on an on-card autograph or a relic. 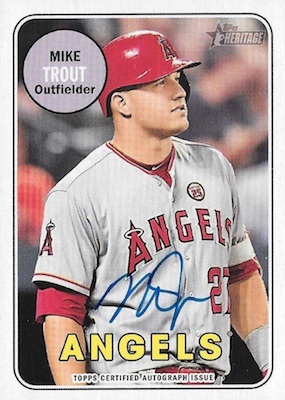 Signatures come in the Real One Autographs line, which also has red ink Special Edition parallels, numbered to 69. Only found in Hobby boxes, the Real One Dual Autographs (#/25) insert pairs two players from one franchise. Whereas the main Heritage paid tribute to the Seattle Pilots expansion team, High Number goes with those beloved New Yorkers in the hard-signed Amazin' Mets Autographs (#/69). There are also the Reggie Jackson Highlights Autograph cards (#/5) and 1969 Cut Signatures (1/1) for baseball players and celebrities of the era. 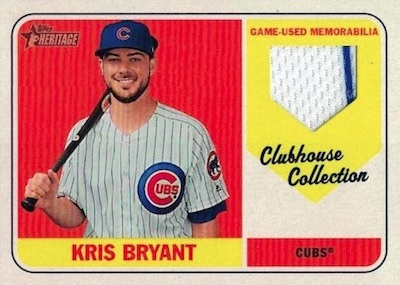 Forming the bulk of the relic choices, the Heritage memorabilia staple, Clubhouse Collection, offers Single, Dual (#/69), Triple (#/25) and Quad (#/10) relic cards. Going up another level are the on-card and Hobby-only Clubhouse Collection Autograph Relics (#/25) and Clubhouse Collection Dual Autograph Relics (#/10). In addition, all CC sets have a Hobby-only Patch (1/1), while the main single-relic insert also comes in Gold (#/99). An added bonus in Hobby boxes, 2018 Topps Heritage High Number Baseball contains 1969 Bazooka Ad Panel cards that mimic the old-school packaging, and 1969 Topps Originals, which are foil-stamped buybacks from the '69 set. 2018 Topps Heritage High J.P. Crawford Rc Real One Autograph SP L@@K!!! Buy 2018 Heritage High Number boxes direct from Topps for $78. 225 cards, including 25 short prints (1:3 packs). Buy complete sets on eBay. PARALLEL CARDS: Black Border (50 copies, Hobby), 100th Anniversary Backs (25 copies), Magenta Backs (10 copies), Flip Stock (5 copies, Hobby). 50 cards. Serial numbered #/999. PARALLEL CARDS: Hot Box Refractor, Refractor #/569, Black #/69, Gold #/5 (Hobby), SuperFractor 1/1. 50 cards. Serial numbered #/100. Buy 2018 Heritage High Number autographs on eBay. PARALLEL CARDS: Special Edition Red Ink #/69. 8 cards. Serial numbered #/25. Hobby only. 6 cards. Serial numbered #/69. PARALLEL CARDS: Patch 1/1 (Hobby only). 3 cards. Hand-numbered #/10. Hobby only. PARALLEL CARDS: Gold #/99, Patch 1/1 (Hobby only). 15 cards. Retail only. Limited to 250 copies per card. See the full 2018 Topps Heritage High Number Baseball checklist spreadsheet. 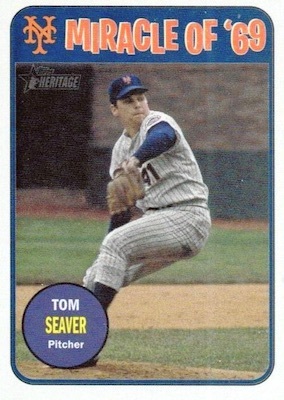 I knew Topps would highlight the ’69 Mets. And once again the Detroit Tigers, World Champions in ’68 are forgotten both in this set and last years too. Seattle Pilots Fan here. After the poor selection of Pilots auto’s in the main Heritage release, I figured they were saving some of the best [Tommy Harper, Tommy Davis, Marty Pattin, Mike Marshall …] for the High Number release. I guess not. Can someone explain how/why there is a Mike Rollyson auto card, but no auto cards of several players [still living] who played on the 1969 Seattle Pilots? And can anyone explain why I paid $50 for the Rollyson auto card on eBay? What is the difference between high number and low number? High number is the update set for Heritage where they add new rookies, trades and players not in the earlier set. Low number is the first release of the year for the brand and is just called Heritage. No Way Jeff. Topps did the Short Prints right this time. All players who changed teams. Also 50 Sp are too many. 25 is passable. what happened to the tigers??? they celebrate 50th anniversary of 1968 World Series and not even a mention?..no relics, no autos…no nothing…..last year also……oh wait…miggy deckle edge…big woop……..they repented for the lack of veteran Jordan Zimmerman in the regular set by making him #501….. I love Heritage, all three sets. But sometimes they simply waste cards. In this set, according to the checklist, there appear to be two cards of Brandon Morrow, and two cards of Eduardo Nunez. Why the redundancy? 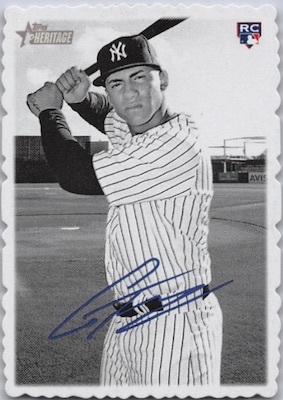 How about a card for Gorkys Hernandez? Or Max Muncy? There are so many players they ignored, yet they duplicate two players. Seems like a waste to me. Nice to see the Miracle of ’69 cards, but 4 of the 5 photos are bad. No Donn Clendenon? He hit 3HR and was MVP. Swoboda’s catch is all wrong. Not the game 4 diving catch. They should have dumped Ryan for Koosman who was 2-0 and won game 7. Cleon Jones catch should have been replaced by one of Agee’s catches. The print run on heritage is obscene. Production was more than doubled. Topp’s greed is on full display with this release. I may but a few singles off ebay later this year but this opening boxes of this retail and hobby is quite a money burn. Well I’ll be a monkeys uncle, Topps finally remembered the Detroit Tigers. The Roy Face real one autograph card is his 1969 card showing him as a Tiger. He is listed as being with the Pittsburgh Pirates in the checklist. He is wearing a Pittsburgh uniform with no Pirates cap though. Yeah, the Roy Face is definitely a Detroit Tiger since he went from the Pirates to the Tigers in 1968. Kind of funny that they still have him in a Pirates jersey. Card shows him as a Tiger on front any way so the checklist is incorrect. Topps usually took a head shot of the players mostly with out caps or caps that the team logo couldn’t be seen on in case the player was traded. Some players were pictured that way even several years after they had been traded. Expansion teams and teams that moved got the same treatment especially in the first two or three series. Most of the 1968 Oakland A’s were pictured cap less in the first two series of cards since they had moved from KC to Oakland that year and only the high numbers had the then current A’s cap. Crudely air-brushed photos started in the 70’s. And curiously the 1964 set featured players in their previous teams uniforms but shown with the logo of their new team. Examples are Don Demeter in a Phillies uniform and Julio Navarro in a LA Angels uniform even though they had been traded to the Tigers and had the Tigers logo on their cards. 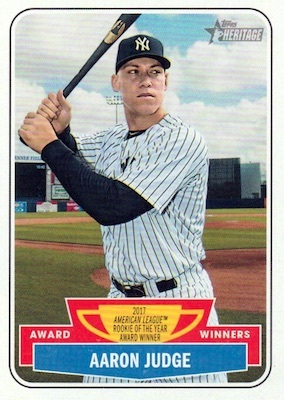 I think that looked much better the the cap less pics and I wish Topps had continued that. I love these cards but there are way too many sub-sets plus Target and Wal-Mart retail sub sets. Where does it end. Most of the relic and auto. plus duels are junk no one wants except for the big name players or rookies also the variations are iffy get a name player or rookie and you have something. This is what drives the price on this product so high. Now they even print their own variations with check list. The cost of building these sets is out of range for so many young collectors. Soon they will classify collecting as gambling. Sad. I love the Heritage sets, but I don’t understand the redundancy. As I pointed out earlier, there are two cards each for Brandon Morrow and Eduardo Nunez, and now I find a card for Christian Arroyo with the Rays, even though he had the same card with the Rays in the base set. Two Christian Arroyo cards, and no Madison Bumgarner? It makes no sense to me. Cards OK but the Quality Control in my box was way off. Had 48 cards miss-cut with the top border missing. Bad news when there was a Ohtani and a Acuna miss cut. I guess I’ll try to get Topps to replace them. Did get a J.D. Davis Rookie auto and a Ichiro mini /100. I bought a Hanger box from Walmart and noticed that only one of the cards (Chase Utley) is different on the back on the top left corner where the card number is. All the common and SP cards in the box have the Topps logo inside a black square in the top left hand corner on the back. The Chase Utley card does not have the Topps logo inside a black square. It has a circle with the card number inside the circle. I can’t seem to find any information on it. It’s just the base card. 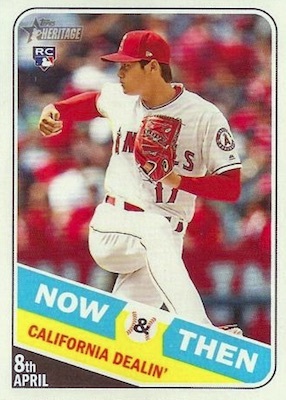 There are two card number styles (generic circle or Topps logo) for some reason but they are both base cards. 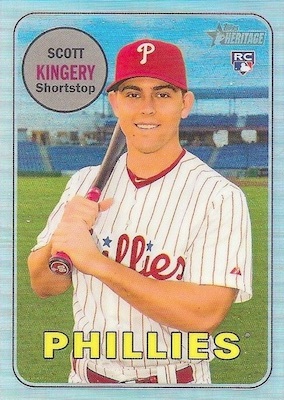 More players have the Topps logo but I have seen several with the version you are describing for Utley. Regarding the Utley & Rodney different backs – Colon #606 also has that back. My GUESS is that their stat box is so long that there wasn’t room for common logo/number/factoid back. Thoughts? 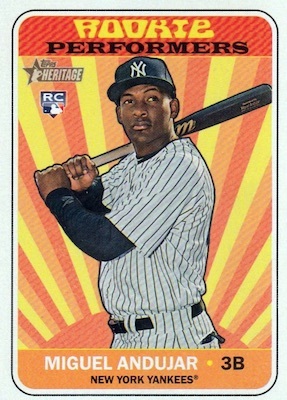 How does Miguel Andujar not have a base card in either Heritage issue? The base rookie for Andujar is a dual Rookie Stars card with Clint Frazier (#114) in the main Heritage. 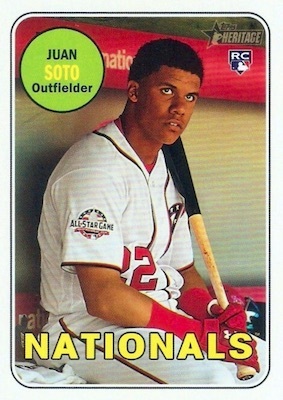 Obviously this product was released solely to showcase Soto . Opened up 3 target packs and literally recognized 3 people. Trash product overall. Is Topps ever again going to issue Manager cards? If they don’t want to put them in the main set, how about as inserts? Manager cards have always been a part of the base set, at least since 1960, and they need to be in the set next year! Can anyone tell me why my Real One Autograph of Roy Face says “reprint” on the back under the Topps logo in the bottom lefthand corner? I’ve looked at some other cards from the same set and they just have the Topps logo. Is it because this guy played in the 50s and 60s? Also, almost every site has his card number as ROA-RFA. It is ROA-RF. He and Rollie Fingers both have the same card number. I’ve also seen the 69 Decal inserts listed as Wal-Mart only. This is not true. I found one in a pack at Meijer. I would imagine it says Reprint because the signed card is a reprint of the 1969 card for Face (#207). The chrome parallels are not parallels ar all. They have different photos. I have never seen this before. Are they all like that? It’s about half from what I can tell. Something weird apparently happened with the SP subjects (#701-725), and most of the image differences are found there. I picked up a autograph card of Sonny Gray, signed in red ink, but it is not numbered. Is there an error with this ? Or is his card just one that is in red ink only ? Looks like Gray signed all of them with red ink. 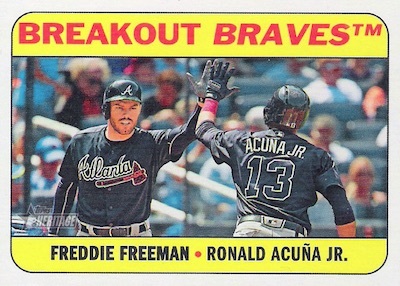 I love the look and feel of these cards, reminds me of popping packs in the 80’s with my dad. But for the life of me, in the past two years I can’t pull a single auto. Napkin garbage patches are just annoying. I just opened a Target retail box of High Number and pulled a “Traded” Variation of Gerrit Cole, bit can’t find a Print run to define if it’s an SP or SSP. I love and hate this product ! Are the base card variations not in the spreadsheet or am I missing them? The spreadsheet is the official version from Topps. They leave the variations off nearly every time.